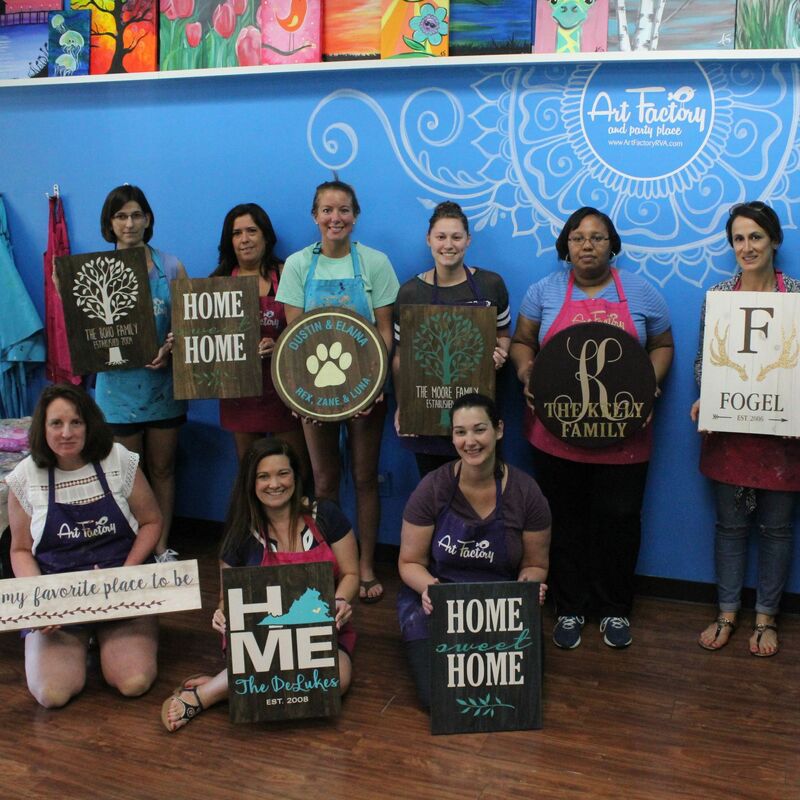 Our instructor will guide you through the process of creating your own custom wooden sign in this 2 ½ hour class. From sanding and staining to stenciling and painting, you will learn to work with natural wood grains, knots and textures. You will leave with a piece of art that is one of a kind. Even if you have never lifted a paintbrush, not to mention woodworking tools, this class is for beginners or expert artisans alike. Our designer will make stencils that allow you to customize your sign with your family name, children’s names, monogram, or special dates in your life. You will also have the opportunity to choose paint colors and wood stain that best coordinate with your style and taste. 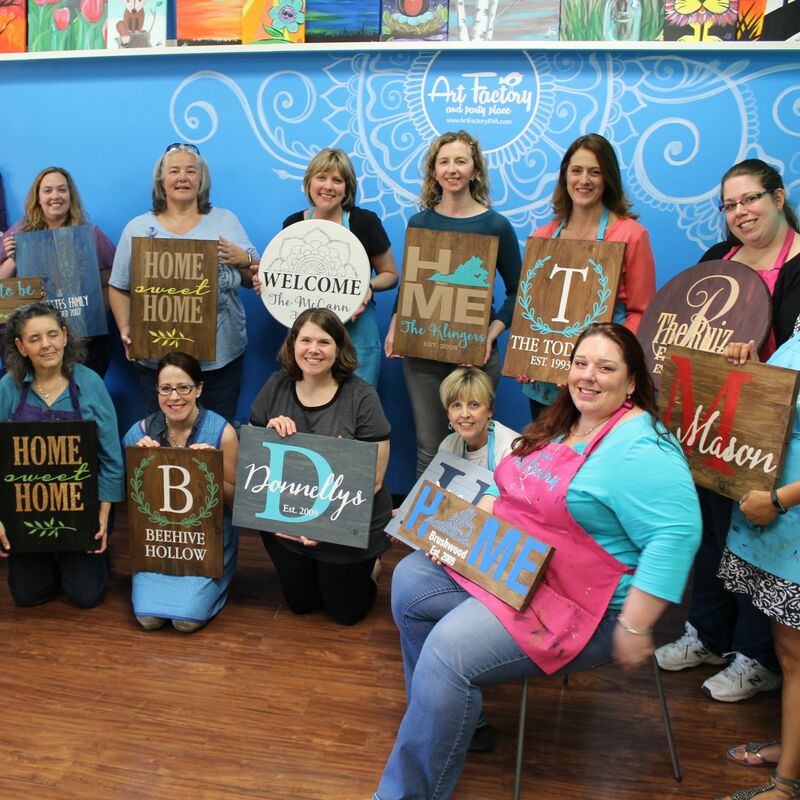 What is a Wooden Sign Design class like? Come with friends, or meet the person next to you. Our instructor will guide you step by step through creating your own unique wooden sign. Stencils for the designs will be created in advance and you will sand, paint and stain wooden signs to create your own piece of art to bring home. Classes will begin on time but we suggest arriving 10 minutes early to check in and get the seat of your choice. Classes are approximately 2 ½ hours long. Are children allowed in a Wooden Sign Design class? Due to the level of difficulty or type of event, we offer many different sessions- teens only, adults only, just for kids and fun for the whole family! Check our calendar for age appropriate classes. Do I need to sign up in advance? Yes! 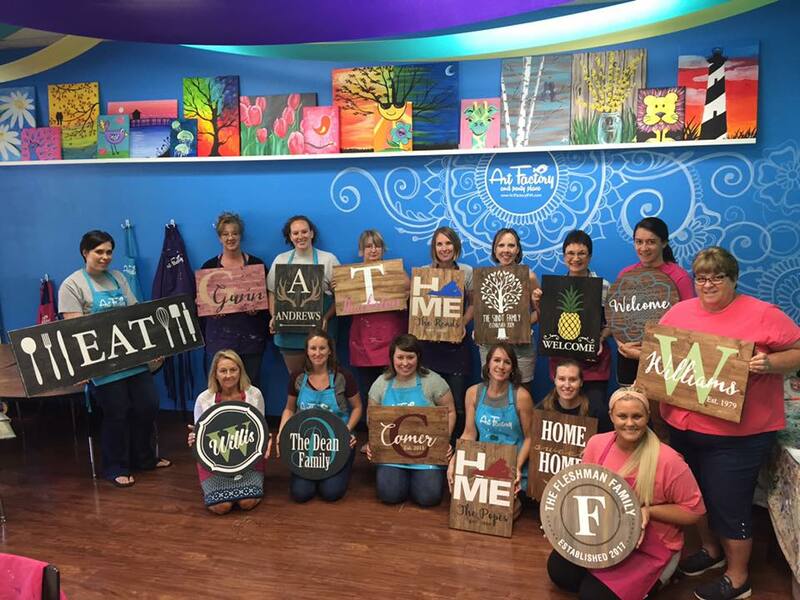 Because the stencils we use for these classes are custom made to your specifications, we need you to sign up in advance on our website. Please double check spelling, as we cannot create new stencils on the spot. If a class is sold out, please give us a call to be put on our waiting list. Can I bring in an adult beverage? You are welcome to bring in a non-alcoholic beverage with you. Two complimentary glasses of wine or one beer/cider will be available for those that are 21+ (Valid ID required). 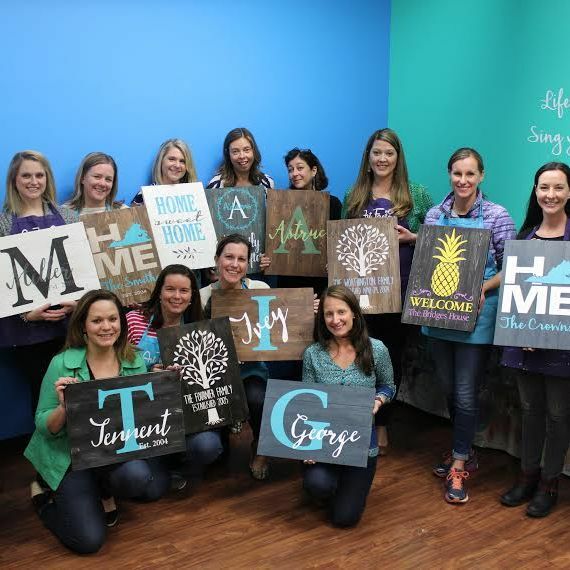 Can we host a private Wooden Sign Design party? Yes! Please give us a call with a date or two already in mind. There is an 8 person minimum for private events. Can I schedule a party at my location? Absolutely! We’d be happy to bring Wooden Sign Design to you! Please give us a call with a date or two already in mind. Please keep in mind this class can be messy and each guest will need a considerable amount of work space. A travel fee may apply. There is a 8-person minimum for private events. What is your cancellation policy? Due to the personalization of each sign, registration is non-refundable for this class. Cancellations made 72 hours prior to the class will be given a credit to reschedule for a future event. Changes: Personalization changes can be made up until 5 days prior to the event. At this point stencils will be made and there will be a $10 recut production fee. 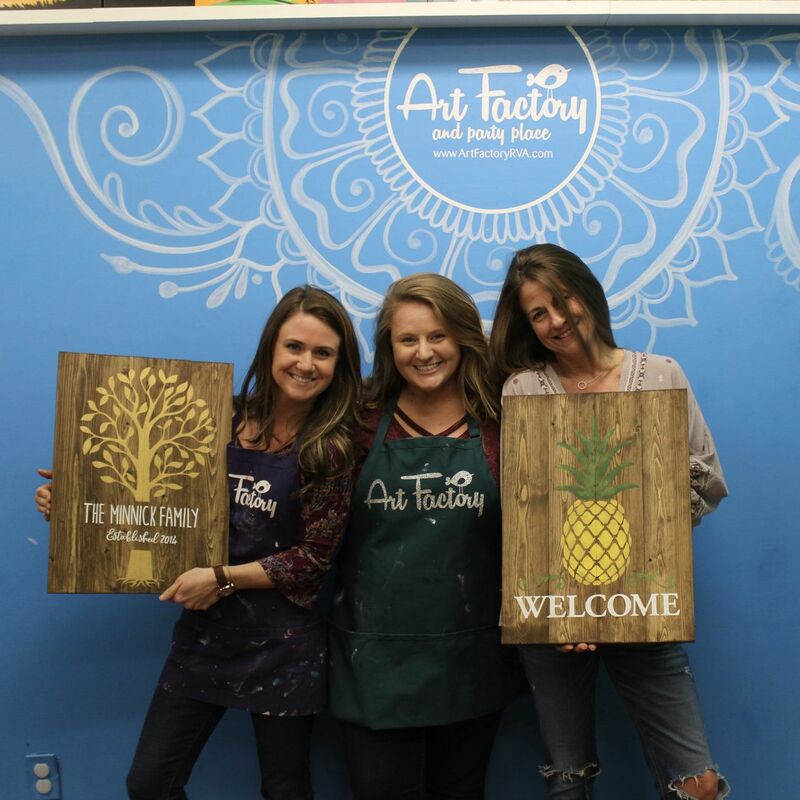 Please Note: The Art Factory and Party Place reserves the right to cancel a painting session at any time due to class size, weather, sickness, etc. If we feel we need to cancel a painting session, every attempt will be made to notify those that have signed up for the session. If you paid online, you will be given the option of rescheduling your session or a refund will be made.